Two Birkbeck LLM students are set to compete in the semi-finals of one of the most prestigious and popular mooting competitions in the UK, led by Mooting Co-Ordinator Jonathan Thorpe from the School of Law. Lewis Aldous (pictured, right) and Daniel Cullen (left), both post-graduates on the LLM Qualifying Law degree programme, are through to the semi-finals of the Oxford University Press (OUP) and Inns of Court College of Advocacy National Mooting Competition. Moot competitions are an ancient method of training lawyers in the art of advocacy, an essential skill for those wishing to practise law. Moots involve two teams, competing in a fictitious appeal case, but in front of a real judge. Teams are scored under several headings – on their ability to interpret and use the law, their skill in presenting legal arguments, and how they deal with questions from the judge during the moot. Birkbeck Law School runs its own moot training programme each academic year. from which students are selected to compete externally, against other universities, in the major UK moots. 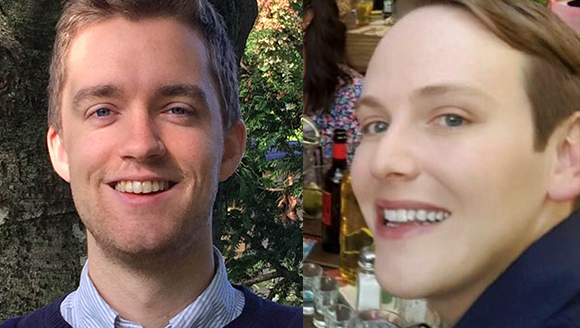 Over the past few years, Birkbeck Law School has had considerable success in the national moots, but LLM students Lewis and Daniel have done exceptionally well this year, beating three highly reputable law schools in legal problems ranging over criminal law, contract law and contempt of court, to reach the semi-finals of OUP. Further congratulations are due to Lewis, who was recently awarded a full scholarship by Inner Temple Inn of Court to study to be a barrister. Jenna Davies leads the extracurricular Enterprise activities at Birkbeck and recently took a group of students on the London Venture Crawl, an event aimed at connecting them with businesses and experts. 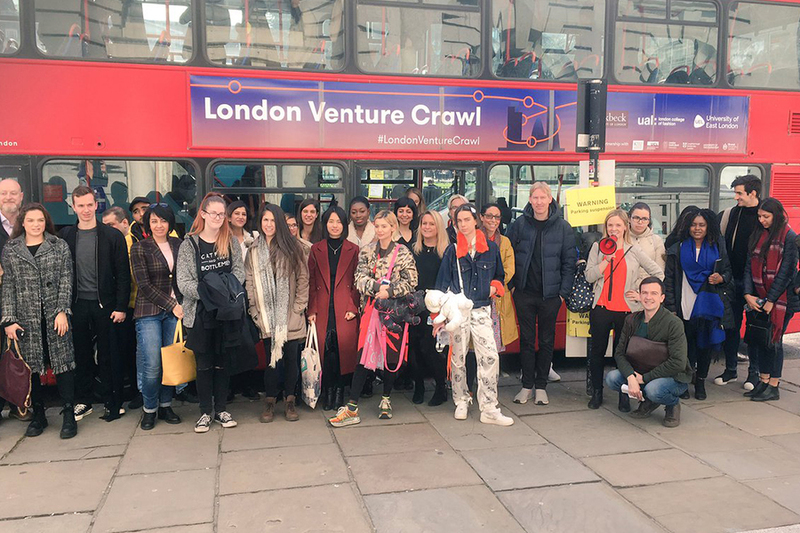 Wednesday 14 March saw a group of entrepreneurial students from Birkbeck join an event that was unlike any other; six double-decker buses, nine London Universities and over 200 students made up the London Venture Crawl and celebrated everything the city offers to budding entrepreneurs. Birkbeck teamed up with University of the Arts and the University of East London and transported students to a range of enterprising spaces around the capital to inspire them to pursue their start-up ventures, meet successful entrepreneurs along the way and ultimately check out a snapshot of what London offers on the start-up scene. The day started bright and early with students ready for the first stop of the day at Campus London, a Google space in Shoreditch. Hearing from Creative Entrepreneurs, an innovative community of creative individuals, the group woke up and boarded the double decker bus that was to be their mode of transport for the day. On board, they were greeted by serial social entrepreneur Benjamin Western, Co-Founder of Gaggle and indiGO Volunteers to pump them up for the rest of the journey. The second stop was at Amazon Fashion, catering nicely for the group as they got an insight into the impressive warehouse where all of Amazon’s fashion items go for checking, photographing and packing. A panel discussion with the top operators gave a glimpse into life at the leading online retailer. Third stop of the day took the group to Grant Thornton, after hearing from their Head of Growth Finance, Sarah Abrahams. Lunch was served and the students met Crate Brewery Founder Tom Seaton who shared his story starting up Hackney’s well-known venue. 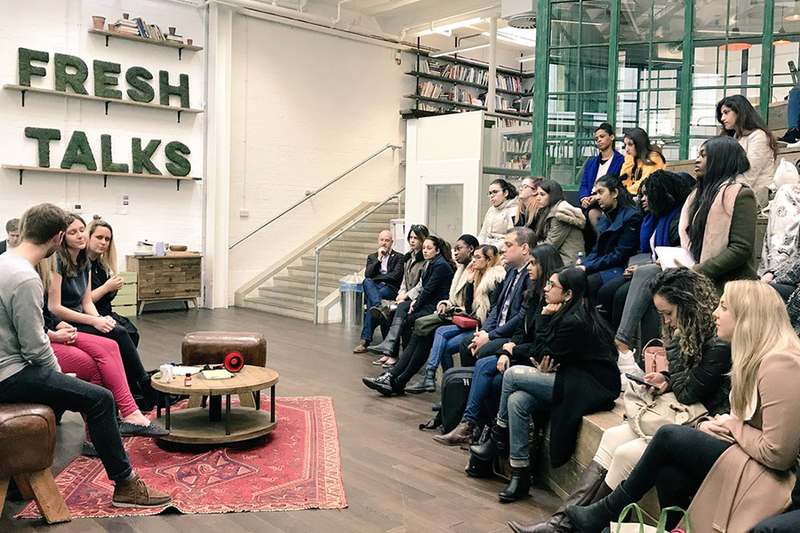 The venture continued on to Hello Fresh, the extremely impressive and relatively new organisation that saw its revenues grow from €2.3m in 2012 to €304m in 2015 – here the students met some of the key players at their London hub and toured the quirky space. The penultimate stop for the group was Innovation Warehouse, a co-working space and community for digital high-growth start-ups. The students were able to hear from the founder Ami Shpiro along with some of the entrepreneurs within the community. The final stop brought all six buses together where students from across the nine universities to could network over a pizza and beverage while hearing from the inspiring Lawrence Kemball-Cook, founder and CEO of Pavegen, as well as take part in the cross-bus pitching competition. Birkbeck stormed through to the final, with Business Innovation student Bobette Kenge rounding off the day on a high and ending what was an extremely eventful, inspiring event for everyone involved. This was an incredible opportunity for our students to network with a huge range of fellow London students, plus receive invaluable advice from the speakers throughout the day. The energetic atmosphere lasted right to the end of the day and was fantastic to see. A collaboration between Birkbeck academic Dr Isabel Davis and artist Anna Burel has produced a series of artworks depicting the history of ‘un-pregnancy’, which are currently exhibited at The Peltz Gallery. Dr Davis, from the Department of English and Humanities reflects on the research which led to the collaboration. Finding out you’re not pregnant can be a very odd experience of nothing happening. While of course, there are plenty of people who feel relieved on discovering they aren’t going to be parents, there are conversely lots who feel disappointed, and often this isn’t the first time they’ve felt this way. So, they are (or their partner is) not pregnant … again. Grieving for something that never was, feels strange. My Conceiving Histories project explores how this nothing, this thing that never was, a thing which I call ‘un-pregnancy’, appears in the historical archives. I am particularly interested in how people in the past thought about the time before diagnosis, either of pregnancy or infertility. What do they have to say about trying to conceive, about on-going childlessness (involuntary or otherwise), about the difficulty of diagnosing early pregnancy, about not knowing whether they were pregnant or not and about early pregnancy loss? What I am finding is that there is a lot of archival material about this apparent nothing. If there are things that can be touched, seen and read in archives about un-pregnancy, then this experience can’t really be a nothing; it must be a something, after all. To pursue this project, I teamed up with a visual artist Anna Burel who, for a long time, has been working on the female experience of the body, particularly the female body in the gynecological encounter. Like me, she is interested in history and thinking about the points of identification between people today and those in the past. Working together, we have started to look at all sorts of aspects of un-pregnancy; simulated, imagined, misdiagnosed and phantom pregnancies at different points in time, as well as the difficulties of diagnosing pregnancy before home testing. Our exhibition, which presents the work we have done in the first phase of this collaboration, is open at the Peltz Gallery, in Birkbeck’s School of Arts, and continues until 13 December. In the exhibition we explore four curious case studies: Queen Mary I’s two false pregnancies (1554-1557); a strange fashion for simulating pregnancy by using a pad (1793); a science-fiction fantasy about discovering how to diagnose early pregnancy and date human gestation (1826); and materials from the Family Planning Association (FPA) archive concerning the international transport of live toads for use in the FPA’s pregnancy diagnostic centre (1949-1964). Contemporaries described it as a fashion which moved around from the back, where it functioned as a bustle, to the front. Most of the evidence for it is satirical. Contemporary cartoonists were savage, presenting The Pad as silly and French. They were particularly delighted, but also perhaps horrified by the idea that it was a social leveler, ironing out differences between rich and poor, large and slim, young and old – making a nonsense of the pregnancy swell as a social sign. A one-act farce, The Pad by Robert Woodbridge opened at the Theatre Royal, Covent Garden the same year. It presents three interlocking stories of couples disrupted because women have taken to wearing The Pad. The main protagonist, Lovejoke, sets out to teach these women a lesson not to ‘outstep the modesty of Nature’ by wearing one. Two of the stories end happily but the third is more bitter. In this story, Sir Simon Meagre and his wife are childless after years of trying; Lovejoke leads him to believe that they might finally have the child they’ve hoped for, although in truth his wife has just taken to wearing The Pad. When the truth comes out, Lovejoke makes an exception for Lady Meagre – she can continue to wear The Pad as consolation for her childlessness. ‘Poor comfort!’ Sir Simon replies, ‘sad substitute for a Son and Heir! – I thought to have had a little boronet [sic]’. Although it is ostensibly a comedy, the play ends on this dissonantly poignant note, bequeathing us some odd evidence for trying to conceive in history. Anna’s work on this bizarre fashion object explores its tragicomic potential. Her series of photographs show women wearing The Pad, sometimes with fools’ caps. Using the typography of Woodbridge’s play to mark up Pads with dates and slogans, Anna’s photographs explore the emotions around the absence of pregnancy. Pregnancy is very privatising and not being able to become pregnant can feel humiliating, as if one can’t get into an exclusive private club, or as if the world is laughing. Women and men have long learned to resort to silence about their struggles to become parents for fear of exposing themselves as in some way inadequate. Maternity clothes today emphasise pregnancy as a special category. The current Western aesthetic in maternity wear stresses the neatness of the pregnancy bump, isolating it and giving it clear definition in relation to the female body. For those looking on from the outside, this kind of definition – both to the contours of the pregnant body and to the community of those who can get pregnant – is sharply distinct from the ambiguities of a life lived in uncertainty about the future, the body, pregnancy and parenthood. The eighteenth-century Pad offers an odd sort of reflection on these complex emotions and there isn’t the sort of evidence that one would really like; what women thought and felt about wearing it, what their motivations were and so on. The imaginative world that it suggests, however, is one in which women can somehow side-step their own longing and the socially isolating experience of un-pregnancy and temporarily enjoy looking pregnant. What if we could collapse the hard boundaries that we set up today, so firmly reinforced by the fashion industry and other institutions, between those who can fall pregnant and those who can’t? Such things are taboo for us: celebrities who fake pregnancies are vilified as if they’ve violated some sacred estate, anyone else is deemed mad. The exhibition is on display at the Peltz Gallery until 13 December. 43 Gordon Square. London. WC1H 0PD. Visit the website to find out more about the project, free exhibitions and events. Follow Conceiving Histories on Twitter. Listen to Dr Davis talking more about the project on The Fertility Podcast. Read the Times Higher Education article on the exhibition. Kelli Weston, MA Film, Television and Media Studies graduate, reports on the Birkbeck Institute for the Moving Image’s (BIMI) recent events. On October 14, BIMI hosted the annual University of Pittsburgh lecture with Adam Lowenstein, who spoke to guests about the urban spaces of Detroit, Michigan and all its implications in the recent horror film It Follows (2014). The discussion touched on the film’s framing of scarcity within an unconventional landscape and contemporary connotations. Listen to Lowenstein’s talk and the following conversation. BIMI partnered with Birkbeck’s Sci/Film on October 28 to present a special Halloween screening of Alfred Hitchcock’s The Birds (1963) followed by a talk from Professor Alex Kacelnick of Oxford University on the nature of birds, complete with recordings. On November 4, in collaboration with the Birkbeck Institute for Social Research and Dogwoof Pictures, BIMI presented The End of the Line (2009), a documentary based on Charles Clover’s 2006 book of the same title about the widespread decline in fish stocks around the world. After the screening of the film, Clover was in conversation with the BISR Guilt Group’s James Brown. You can find more information about the Guilt Group on their website. On November 7, with the London Korean Film Festival, BIMI presented ‘Detours through the History of Korean Cinema’ a focus on essay films – My Korean Cinema (2006) by Kim Hong-Jun and Cinema on the Road: A Personal Essay on Cinema in Korea (1995) by Jang Sun-woo – which both explore and interrogate the history of Korean cinema. On November 11, just in time for filmmaker John Berger’s 90th birthday, BIMI and the Derek Jarman Lab presented Seasons of Quincy: The Four Portraits of John Berger followed by a symposium the next day where a group of panellists discussed Berger’s legacy as a broadcaster, activist, artist and art critic while showing clips of his work over the years. On December 2, BIMI and Dogwoof Pictures presented The Age of Stupid (2009), Franny Armstrong’s drama-documentary-animation hybrid film starring Pete Postlethwaite about the last man on earth pondering the consequences of human apathy toward climate change. On December 10, as part of the Children’s Film Club and the Irish Film Festival, BIMI screened Song of the Sea (2014) followed by a free shadow puppet theatre.